If you ask for directions to “the Sofitel” in the streets of Amsterdam, you may receive perplexed looks (as I did). 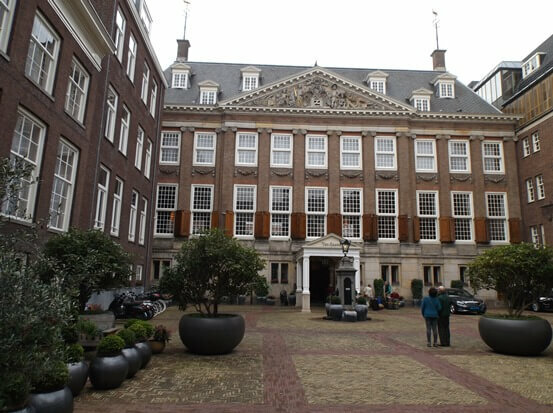 To locals, the 15th-century monastery-turned-Dutch-Admiralty-turned-City Hall is simply known as “The Grand.” Stepping through the brick archway on Oudezijds Voorburgwal, Amsterdam’s oldest canal, it’s easy to understand why. The handsome courtyard and surrounding brick buildings of the Sofitel Legend The Grand Amsterdam are a testament to Dutch Golden Age sensibilities—palatial in any sense of the word, but not giving way to overly gaudy or imperial ornamentation. Before entering, be sure to back up to the far side of it to admire the façade, topped with a Greek style tympanum depicting the Dutch Lion protecting the garden of Holland, flanked by Lady Justice, the god Mars, and the sea god Neptune. In comparison, the interior lobby comes as a bit of a surprise. Designed by French architect Sybille de Margerie, the space feels thoroughly modern and boutique, with creamy white interior arches and highly polished marble floors punctuated by French and Dutch stylistic elements, especially tulips and butterflies, which burst from tall silver vases or dangle from chandelier-like ceiling fixtures. 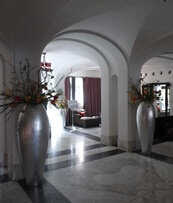 Attached to the lobby is the hotel’s Michelin-starred restaurant, Bridges, helmed by Chef Joris Bijdendijk. Arguably the best restaurant in Amsterdam, Bridges seamlessly carries over the design sense of the lobby, combining thickly curved and straight lines in a way that feels entirely natural, from the bulbous, white raw bar and shimmery silver bead window blinds to the expressive avant garde murals by Dutch painter Karel Appel. The food itself is a work of art, both in presentation and flavor. 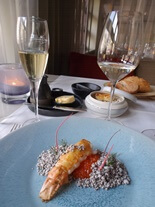 In fact, just reading the descriptions in the menu is enough to drive the stomach into a tizzy—roasted langoustine with trout eggs, curry cream, and popped wild quinoa; Jerusalem artichoke with smoked sprat, organic brown trout fried on brioche with green elderberry, almond cream, and beurre rouge, and praline with macadamia with sweet chervil root crisps and salted caramel ice cream. On the palate, they were even better, especially when enhanced by glasses of wines like German Grauburgunder, Hungarian Tokaji, and French Blanc du Grand Cres. After a meal like that, there’s little one can do except lie in bed in post-culinary bliss. Happily, my room, Canal House Suite 741 (starting at $876 per night) wasn’t far away. Although in the middle of the Grand’s room class scale, which ranges from “legendary” suites at the top to the “classic” rooms at the bottom, the suite nonetheless housed a significant level luxury, shown to me by head butler Mauricio de Aguiar Silva, who, it must be said, treated me (as did the rest of the staff) with the same deference as any of the fame or diamond-decked hotel guests, regardless of my shabby travel writer’s wardrobe—something which does not always happen during my reviews of luxury hotels. To the left, a long, simply furnished living area stretched along the canal, with a sofa and sitting area at one end and table and desk at the other—excellent for quiet work or private chats, but perhaps not for anything festive. Right from the suite’s entrance takes you into the relatively basic, but very comfortable bedroom, girded by large windows to the right and the master bathroom to the left, which is one of the room’s highlights. Much like a top-shelf caviar, the deep, full-size tub in the center is the sort you can’t resist dipping into regardless of whether you enjoy baths or not. Add in the shampoos and creams by Hermes, and it’s easy to spend half the evening lounging in it (as I did). Props must also be given to the high-tech Toto Washlet toilet, if only for the directional-controlled oscillating streams. Adjacent to the bedroom is a private, step down porch, which despite lacking any views beyond gapes through the ceiling windows of the next door room and adjoining staircase, is remarkably private and cozy and an excellent place to enjoy a fine cigar, flute of champagne, or simply the morning newspaper with a cup of tea. 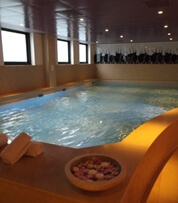 It’s also well-worth reserving some time for the Sofitel’s So Spa on the second floor. In many ways, the facility itself outshines the expertly administered spa treatments, which include more than a dozen internationally based massages, scrubs, and peels. The lower flower contains an ultra-chic indoor pool area, with several relaxation nooks, plus a Turkish style steam bath and Scandinavian-style dry sauna. In short, the Sofitel Legend Grand is the most dangerous type of hotel—the kind that’s hard to leave. It’s especially so in a city like Amsterdam, which has so much art and culture to explore. Even I could not resist giving up a day of Van Goghs and Rembrandts to luxuriate in all aspects of The Grand and was happy to do so. Of course, the cost of such extravagance is admittedly beyond the financial ability of most (certainly travel writers), but you do get your money’s worth, and a bit more. And frankly, when anyone asks me what the best hotel I’ve ever stayed at is, the Sofitel Legend The Grand Amsterdam is always on the tip of my tongue. Mike Dunphy was a guest of the Sofitel Legend The Grand Amsterdam and Bridges restaurant. 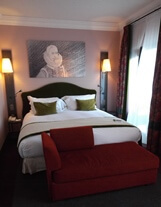 You can make a reservation directly through the Accor Hotels website or compare rates at Priceline and Expedia.